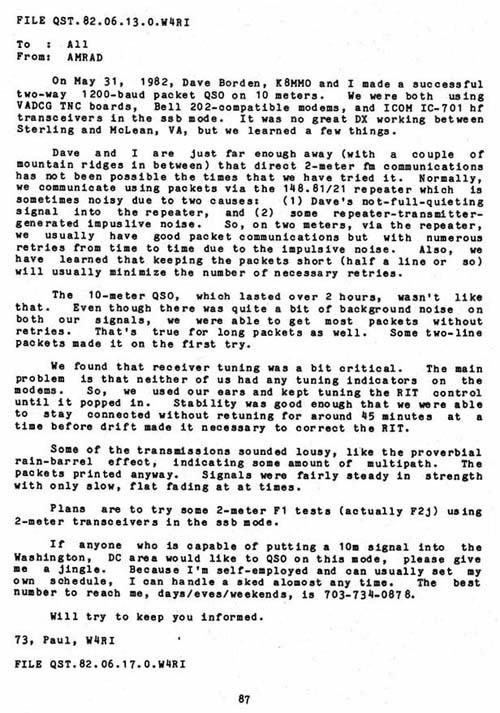 On May 31, 1982, Dave Borden, K8MMO and I made a successful two-way 1200-baud packet QSO on 10 meters. We were both using VADCG TNC boards, Bell 202-compatible modems, and ICOM IC-701 hf transceivers in the ssb mode. It was no great DX working between Sterling and McLean, VA, but we learned a few things. Dave and I are just far enough away (with a couple of mountain ridges in between) that direct 2-meter fm communications has not been possible the times that we have tried it. Normally, we communicate using packets via the 148.81/21 repeater which is sometimes noisy due to two causes: (1) Dave's not-full-quieting signal into the repeater, and (2) some repeater-transmitter-generated impulsive noise. So, on two meters, via the repeater, we usually have good packet communications but with numerous retries from time to time due to the impulsive noise. Also, we have learned that keeping the packets short (half a line or so) will usually minimize the number of necessary retries. The 10-meter QSO, which lasted over 2 hours, wasn't like that. Even though there was quite a bit of background noise on both our signals, we were able to get most packets without retries. That's true for long packets as well. Some two-line packets made it on the first try. We found that receiver tuning was a bit critical. The main problem is that neither of us had any tuning indicators on the modems. So, we used our ears and kept tuning the RIT control until it popped in. Stability was good enough that we were able to stay connected without retuning for around 45 minutes at a time before drift made it necessary to correct the RIT. Some of the transmissions sounded lousy, like the proverbial rain-barrel effect, indicating some amount of multipath. The packets printed anyway. Signals were fairly steady in strength with only slow, flat fading at at times. Plans are to try some 2-meter Fl tests (actually F2j) using 2-meter transceivers in the ssb mode. If anyone who is capable of putting a 10m signal into the Washington, DC area would like to QSO on this mode, please give me a jingle. Because I'm self-employed and can usually set my own schedule, I can handle a sked almost any time. The best number to reach me, days/eves/weekends, is 703-734-0878. Will try to keep you informed.